Productivity growth in the US has slowed down markedly since the heady ‘new economy’ days around the turn of the century. The slowdown is similar to the much-remarked experience after the halcyon post-war years (Table 1). Moreover, a number of recent papers have pointed out that productivity growth had weakened significantly prior to the ‘Great Recession’ (Cardarelli and Lusinyan 2015, Fernald 2015) and analyses based on time-series econometrics (see Table 2) have found that it is trend labour productivity growth that has decreased (Antolin-Diaz et al. 2017, Ollivaud et al. 2016). The slowdown does not appear to be a temporary blip associated with the financial crisis. Source: based on data underlying Fernald (2016) available here. The coexistence of weak productivity performance and rapid technological advance becomes even more puzzling and worrying when it is recognised that from a growth accounting perspective, the underlying reason for slower labour productivity growth is almost entirely weak total factor productivity (TFP) growth (Fernald et al. 2017). In a conventional neoclassical growth model, a rise in the TFP growth rate induces capital accumulation, and the steady-state rate of labour productivity growth is proportional to TFP growth. So, the TFP growth rate is a fundamental building block for projections of the rate of growth of potential output and also the foundation stone for future economic growth. It is of course the case that pundits are divided on what technological progress will imply for future productivity growth over, say, the next ten years. Partly this is a question of how big the cumulative economic impact of the new technologies is expected to be and partly a question of how soon it will materialise. The range of ‘informed’ opinion is currently very wide, ranging from TFP growth in the business sector of the American economy at an annual average of 0.4% per year (Gordon 2016), to 2% per year (Brynjolfsson and McAfee 2014). The difference between these projections is between a belief that the economic impact of the new technologies will be unimpressive and an expectation that a large economic impact is just around the corner. Interestingly, the Congressional Budget Office, which provides a regular projection, is about halfway between these two extremes at 1.1% per year (CBO 2017) having projected 1.5% per year in August 2006. Is the econometric evidence to be preferred to techno-optimism or techno-pessimism? Our recent research (Crafts and Mills 2017) provides an historical perspective on the relationship between estimated trends in TFP growth and subsequent outcomes. Using a Kalman-filter method, we estimated an unobserved components model for quarterly TFP growth in the US business sector using data for 1947Q2 to 2016Q4 from John Fernald’s website. We first used the full sample of observations to produce a ‘smoothed’ trend growth estimate which is shown in Figure 1. Then we obtained two fixed-window estimates (based on the data for the previous 20 or 25 years) for each successive quarter from 1967Q2 and 1972Q2, respectively. This exercise utilises data that would have been available to agents at the time and unlike the ‘smoothed’ estimate does not include future information that would not have been available ex-ante. These trend estimates are basically of a similar type to those which have been produced recently. The results are shown in Figure 2. We also plot the outturn for the average TFP growth rate over 10 years forward from each data point. Our main findings are as follows. First, over fifty years American trend TFP growth in the business sector has declined slowly but steadily over time, from about 1.5% per year in 1967 to about 1% per year by 2016. Second, forecast trend TFP growth based on estimated trends over the previous 20- or 25-year window exhibits considerable variation and does not show monotonic decreases. From a level around 2% at the start of the 1970s, these forecasts are generally falling until they reach lows of about 0.5% at times in the 1990s before rising to about 1.2% in the mid-2000s, and then falling back to 1990s levels more recently. Third, average realised TFP growth (adjusted for capacity utilisation) over 10 year intervals – the horizon for which the Congressional Budget Office makes projections – has also varied substantially over time. 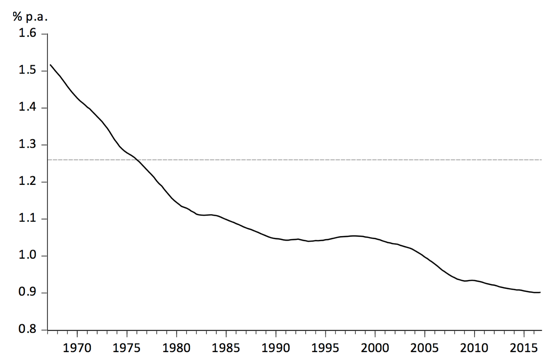 The outturn fell from 2% per year or a little less for intervals starting in the 1960s to 0.5% per year or a little more for intervals from the early-1970s to the late 1980s. It then rose to a peak of 2% in the mid-1990s for the years encompassing the height of the ‘new economy’ before falling back to below 0.5% per year for the period of the financial crisis and its aftermath. Fourth, these 10-year-ahead outturns are not well predicted by recent trend TFP growth. In particular, sharp reversals of medium-term TFP growth performance are not identified in advance. Indeed, forecasting on this basis would have missed the productivity slowdown of the 1970s, the acceleration of the mid-1990s, and the slowdown of recent years – in other words, all the major episodes during the period! These results provide a perspective on today’s discussions of the prospects for future American productivity growth. Three points stand out. First, medium-term TFP growth is very unpredictable. Recent performance is not a reliable guide, implying that an econometric estimate of low trend productivity growth currently does not necessarily rule out a productivity surge in the near future. The precedent of the 1990s is witness to this. Second, a smoothed estimate of trend TFP growth has changed only slowly over time and is well above recent actual TFP growth. This suggests that pessimism about long-term prospects can easily be overdone. Third, given the substantial fluctuations in medium-term TFP growth and the likelihood that forecasts are confounded, it would not be surprising if revisions to expectations about future productivity growth are a source of significant aggregate-demand shocks. 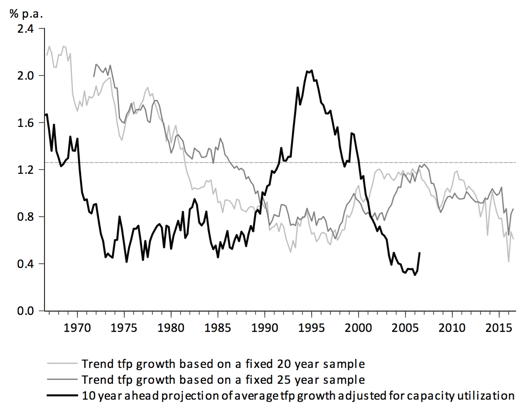 Overall, it is uncertain how long slow TFP growth will persist in the US. It does, however, seem clear that econometric estimates of trend TFP growth extracted from recent past performance should not be given much weight in projections of average TFP growth rates over the next 10 years. Reasonably enough, the CBO seems to take a similar view. Informed views of the prospects for technological progress and its impact on productivity are potentially more valuable but currently exhibit substantial divergence. Finding an answer to the question of whether there is a ‘new normal’ low TFP growth rate has to go into the ‘too difficult’ box. Antolin-Diaz, J, T Drechsel, and I Petrella (2017), “Tracking the Slowdown in Long-Run GDP Growth”, Review of Economics and Statistics, forthcoming. Cardarelli, R, and L Lusinyan (2015), “U.S. Total Factor Productivity Slowdown: Evidence from the U.S. States”, IMF Working Paper no. 15/116. Congressional Budget Office (2017), The Budget and Economic Outlook 2017-2027. Fernald, J (2015), “Productivity and Potential Output before, during and after the Great Recession”, NBER Macroeconomics Annual 2014, 29, 1-51. Fernald, J (2016), “Reassessing Longer-Run U.S. Growth: How Low?”, Federal Reserve Bank of San Francisco Working Paper Series WP 2016-18. Fernald, J, R Hall, J Stock, and M Watson, M (2017), “The Disappointing Recovery of Output after 2009”, NBER Working Paper No. 23543. Ollivaud, P, Y Guillemette, and D Turner (2016), “Links between Weak Investment and the Slowdown in Productivity and Potential Output Growth across the OECD”, OECD Economics Department Working Paper No. 1304. As stated by Robert Solow in the New York Times in 1987, the paradox was that ‘'you can see the computer age everywhere except in the productivity statistics”. These estimates are inferred from comparative statements in these authors’ books rather than being stated directly by them.